5th June 2004: Attention initially went to the relays, these being mechanical items and obvious candidates for further inspection. The contacts on the antenna changeover relay (ringed) looked pretty sick with the contact plating flaking off, so I decided to replace it. The original was an Omron MX2P part which is no longer available. 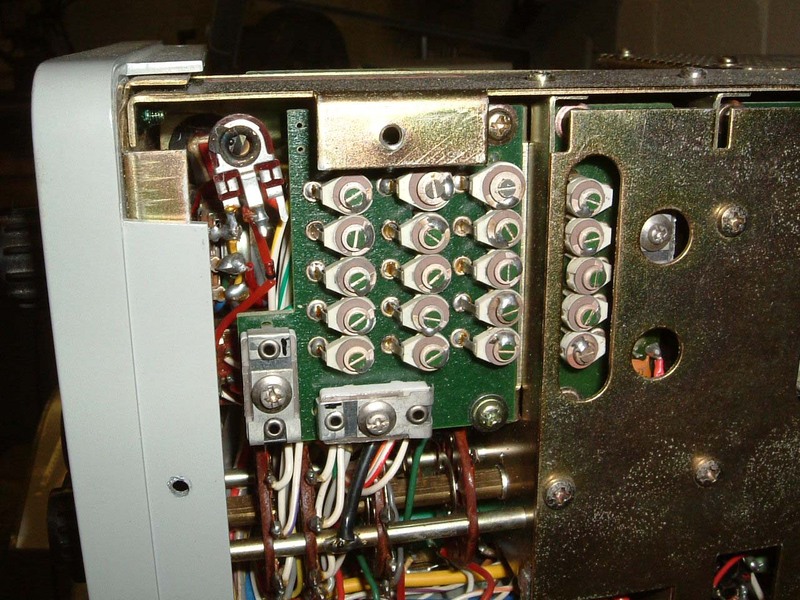 Yaesu recommend attaching an Omron MY2 to the existing relay base to get round the problem, although the MY2 is a much more substantial relay. This is the MY2 replacement shown above wired to the smaller base of the existing relay. 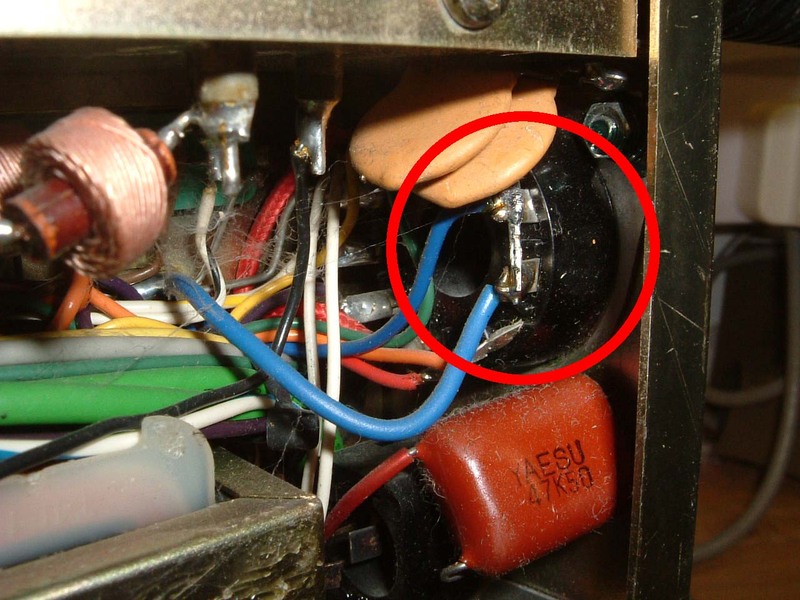 It really is a squeeze to get in, the 'flying saucer' capacitor has to come out of the PA cage to get the new relay in, and the plastic cover has to come off the relay or it just won't fit at all. Click the pic on the left for a larger version, or indeed for any pictures on this page. On a hunch, I carefully took hi-res pictures of the wiring arrangement of both sides of the modified board and removed the mod. The tracks which were cut as part of the modification were reinstated, and the ceramic caps which had their leads cut were replaced with new items. Voila - plenty of sound on all bands, and the S meter works properly. RX is sorted, onto the TX. 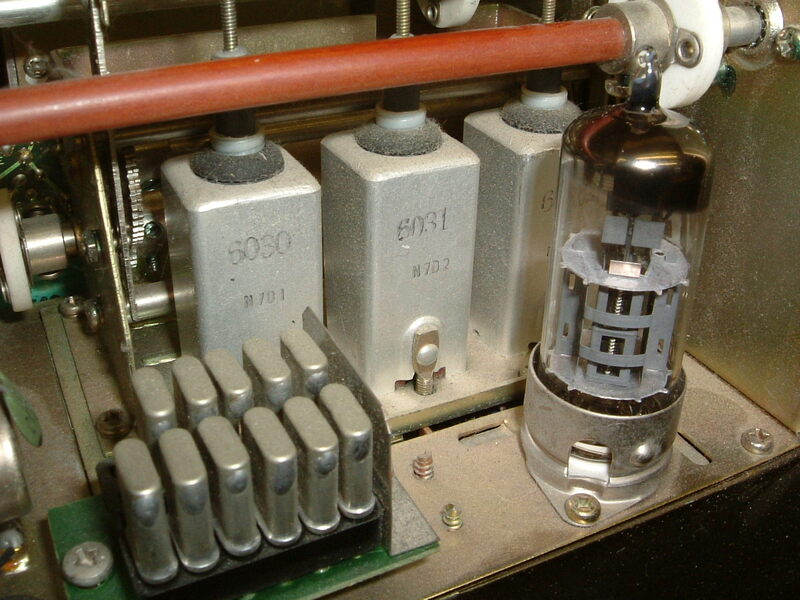 The FT-101 will not transmit if the accessory plug is missing, as this one is. 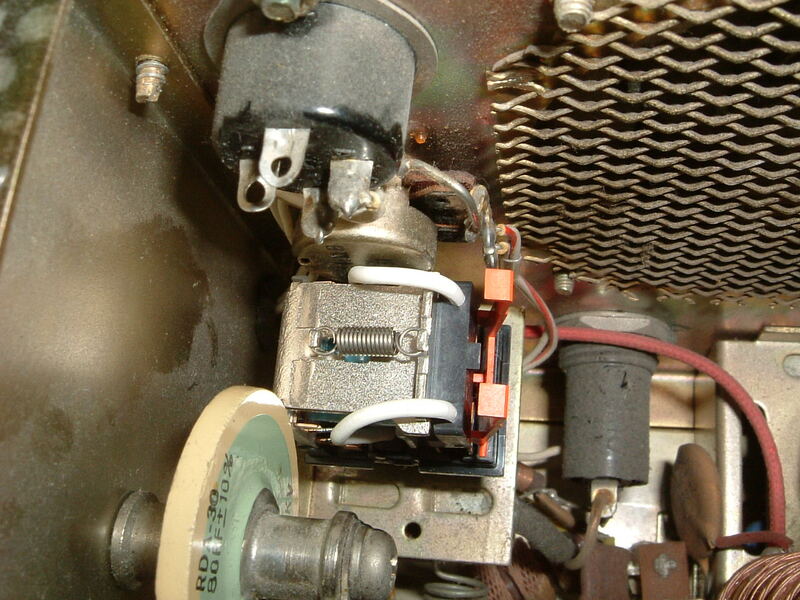 It's used to jumper the two blue wires on pins 1 and 2 in order to power the heaters of the 6JS6C's. 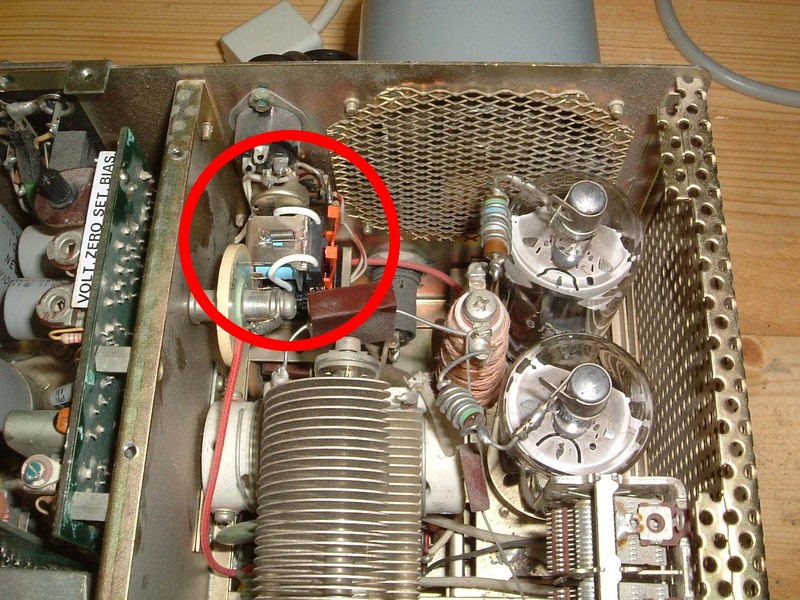 This is not as dim as it sounds, the reason is to do with the optional transverter stealing power from the transceiver and preventing the output valves from heating up and drawing current by having the link missing between pins 1 and 2. Temporarily fixed for now with a jumper wire across the two pins. Note: Since writing this, MattD from the uk.radio.amateur newsgroup kindly mailed me an accessory plug FOC, so I now have the proper plug. Cheers Matt! I'm on the home run now, only a couple of problems left. No CW keying (turned out to be a tarnished 1/4" jack socket), and low output on 14MHz and above, like about 3-5W maximum. The 14MHz+ problem turned out to be alignment errors with the permeability tuned coils shown on the left, I'm still working on it, but the 6JS6's will pull an easy 300mA+ now with the carrier control at moderate settings and plenty of RF output. Everything is now ship shape, and alignment has been completed. The RX is sensitive now, and the TX is putting out plenty of power on all bands. 24th October 2004: This TX has still not been put on air and has developed an intermittent fault on both RX and TX. 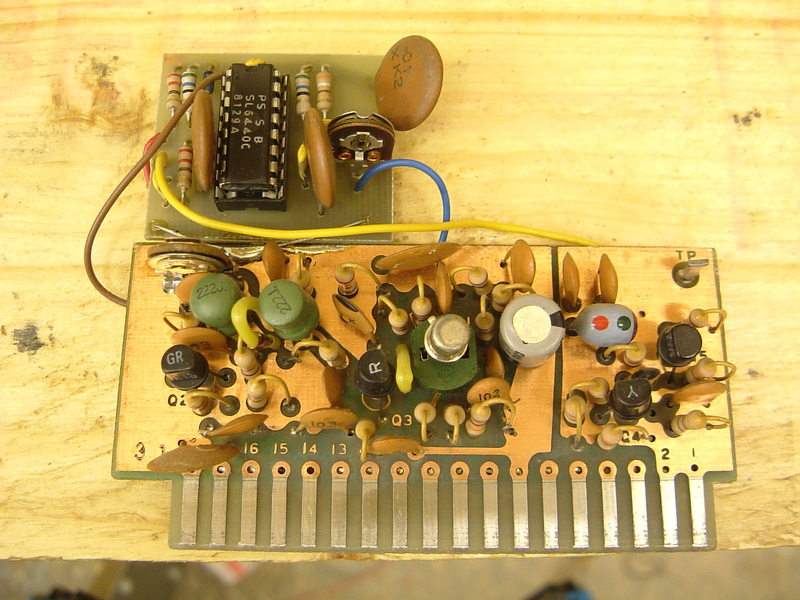 This has been traced to the trimmer capacitors for the band change oscillator, and some other trimmers are showing signs of cracking. An order has been placed with Mouser in the USA for replacement Japanese ceramic trimmers which have now arrived. Every ceramic trimmer in the unit will shortly be replaced (and there are plenty of them).